A new documentary is currently being aired on BBC that features the work of Chabad Lubavitch's Campus Shliach in Liverpool - Rabbi Shmuli Brown. 'Angels of Mersey' is a new series that follows chaplains from different faiths who work in Liverpool. Employed in hospitals, in the universities, at football grounds and in the street, they all offer a listening ear, spiritual guidance and a helping hand when life gets tough. The series examines the work of the chaplains and looks at the lives of the people they touch. 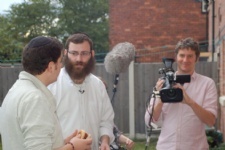 A BBC film crew spent time with Rabbi Brown and his family filming him signing up Jewish students at events such as the University Freshers Fair and hosting a BBQ for Jewish students at his home. 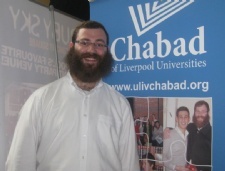 Rabbi Shmuli & his wife Tzivia moved to Liverpool in the summer of 2010 to open the door of Judaism to all Jewish students and faculty at Liverpool Universities, and establish a Chabad House, a place where Jews of all backgrounds and degrees of observance can enjoy and explore their Jewish heritage in a warm, welcoming and non-judgmental environment. Rabbi Shmuli, was born in Manchester, studied in the UK and Israel and was ordained by the Chief Rabbi of Israel in 2000. He worked in the Ukraine for nearly a decade establishing youth clubs across the former Soviet Union and then established a very successful publishing house in Dnepropetrovsk. 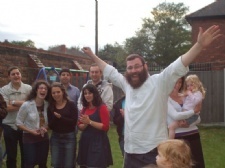 He has taught children, students and adults the Jewish way of life through formal and informal education.